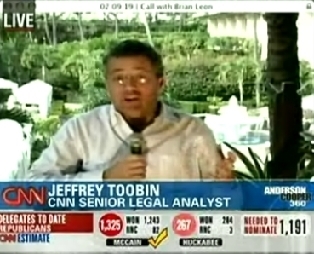 When news of the Eliot Spitzer scandal first broke, I immediately turned to CNN to hear what Jeffrey Toobin had to say. Toobin is CNN’s Harvard Law School-educated former prosecutor who has morphed from a legal analyst into a political analyst. Over a succession of Tuesday’s I have cursed the screen when CNN has subjected me to Toobin’s political analysis, which is far from his forte. Ever since the days of the O.J. Simpson case, on the other hand, I have come to rely upon the legal analysis and writing of Toobin.Frustratingly, Toobin bites were scarce on Tuesday night. He appeared briefly over a scratchy phone line, stating cursorily that he had attended law school with Spitzer. Of all the stories for Toobin to be missing, this was not the one. Who needs to listen to Toobin to hear about super delegates? We have seasoned political hands, such as James Carville, Paul Begala and Donna Brazile for that. We want to hear what the legal expert has to say about the legal trouble a prominent legal figure has gotten himself into. Last night, viewers caught a glimpse of vacationing Toobin sitting in front of tropical fauna. While the technology wasn’t perfect, Toobin provided insightful and interesting analysis on his former classmates careers.